With the 2018 Tour de France coming up, hansgrohe, a leading brand in the bathroom and kitchen industries will unveil its international media campaign, featuring the champions of the BORA-hansgrohe cycling team. Also planned during the summer: the release of a « Peter Sagan » hand shower, and the organization of a predictor game on the official BORA-hansgrohe App. Less than a month before the launch of the 2018 Tour de France, hansgrohe presents its campaign: «Your daily dose of energy», in which champions are showcased in an original and unprecedented way. Peter Sagan, sole ambassador of the 2017 campaign, will be joined by 3 riders from the BORA-hansgrohe cycling team: the young Italian Davide Formolo, the German National Champion Marcus Burghardt, and Rafal Majka, former King of the Mountains in the Tour de France. In a communication campaign, riders are seen enjoying a fresh shower, as they usually do after an intense athletic competition. The TV campaign, featuring Peter Sagan, will be broadcasted during the whole month of July on the German channel ARD, but also in France on Eurosport and France Television. The clips and a dedicated social media campaign featuring the World Champion but also Formolo, Burghardt and Majka, will be deployed on Facebook and Instagram, from June 23rd to July 29th, in Germany, Austria, Switzerland, France, Belgium, Italy, United Kingdom, Poland, Denmark, Czech Republic, Slovakia, Turkey and in the Netherlands. Finally, the campaign will also be deployed at the hansgrohe points of sale and with several display campaigns. This 360° media campaign, which proved very successful in 2017, aims to introduce to the public, in a fun and original way, the two hansgrohe universes, that are water and cycling, and to strengthen the German brand as a reference in international sport sponsoring. hansgrohe designed a (very) limited edition of a « Peter Sagan » hand shower, engraved with the logo and name of the triple World Champion. Only 100 units will be manufactured at the production site in Schiltach and will be available on the market. Launched in July 2017, the official BORA – hansgrohe app is available for German and English- speaking cycling fans to download from the App Store for iOS or from Google Play for Android. 360-degree images provide exclusive behind-the-scene glimpses and a professional racing centre with a news ticker will keep cycling enthusiasts, no matter where they are, up to date with push messages on results, news about the team and its cyclists. Real fans can purchase their gear in the integrated fan shop. 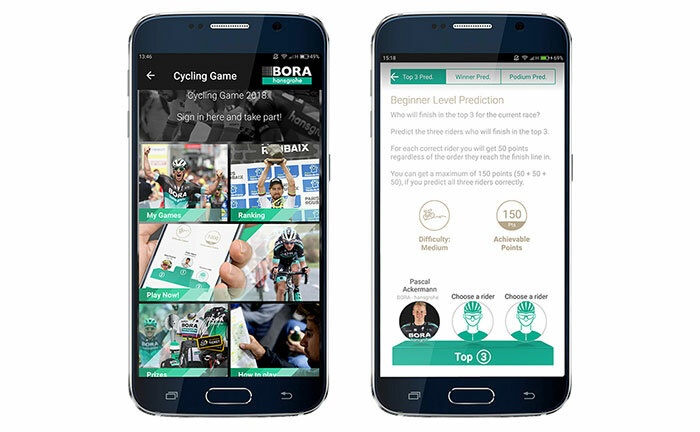 The unique and official BORA-hansgrohe cycling game 2018 is launched in June on the app, with a chance to win amazing exclusive prizes by betting on stage winners and answering bonus questions. More than 30,000 € in prizes, ranging from merchandise to high-quality sponsor products, to personally autographed jerseys by the riders, are available to win.